One of my pet peeves is a theme author who abandons their work. A couple years ago I built an e-commerce site for a client and emailed the theme vendor a couple questions about one of their themes. The author told me that that theme was going to be discontinued and we should use their newest theme that they promised to support. Fast forward a couple years and I went to upgrade my server to PHP 7.2. I did this first in my staging environment and the website broke. The theme could not handle the new version of PHP, which is much faster and more secure. I went to the Themeforest website and told the author that the theme breaks with PHP 7.2. I didn’t hear back and a few days later noticed they took the theme down. I emailed them and they said it was too expensive to keep the theme up. So I am writing this post to warn you to be careful of theme authors that don’t support their theme and abandon projects. Theme hasn’t been updated for several months, even years. When looking at a theme make sure that it has been updated recently. If not, go elsewhere. Good theme authors keep themes up to date with each new version of WordPress, WooCommerce, etc. Bad Reviews: Check out reviews of the company creating your theme, as all theme authors are NOT equal. Theme doesn’t work with latest version of WordPress, PHP and if it’s a shopping cart, WooCommerce or whichever cart you use. ALWAYS Check that the theme works with latest versions. Sometimes in an effort to be original, we try new themes. The problem is unless it’s a good company; the theme may come and go very quickly. So I tend to like themes that are popular, but have tons of configuration settings. Most of the new page builders allow you a lot of latitude in what you want to do, so there’s no reason your site has to look like a duplicate of someone else’s using the same theme. Suggestion for Theme Sellers: Minimum standards are needed. 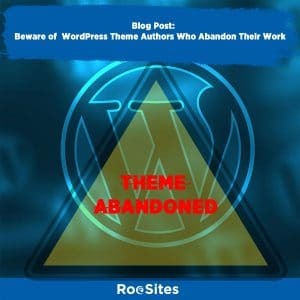 When a theme author takes down a theme they should be required to announce a theme is being discontinued and they should have to support the theme for a minimum amount of time. I would say 3-6 months. Bottom Line: Do your research; check out the theme you will use carefully as well as the theme author. A few minutes of research up front will save you agony down the road when a theme is abandoned.